Smart charging is the intelligent way forward, where charging can be shifted based on grid loads and in accordance to the vehicle owner's needs. Today there has been a significant increase in development of electric vehicles. Smart charging is the intelligent way forward, where charging can be shifted based on grid loads and in accordance to the vehicle owner's needs. So along with EVs (Electric Vehicles) their communication with the EVSE (Electric Vehicle Supply Equipment) has to be considered. ISO 15118 specifies the communication between Electric Vehicles (EV), including Battery Electric Vehicles and Plug-In Hybrid Electric Vehicles, and the Electric Vehicle Supply Equipment (EVSE). The complexity of the protocol necessitates considerable amount of testing as described in Part 4 of the standard to enable interoperability between multiple independent implementations. 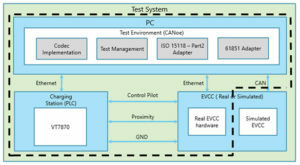 This article describes the approach and the solution used to perform conformance testing on a simulation platform and the actual hardware according to ISO15118 Part 4 standard. ISO 15118-1 introduces the overall flow of communication. The remaining parts of the standard deal with wireless communication. ISO15118 part 1 defines the general requirements and use cases. 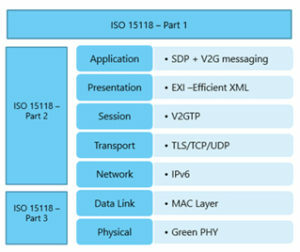 ISO15118 Part 2 standard provides the requirements for the top 5 layers of the Open System Interconnection (OSI) model viz. Application Layer, Presentation Layer, Session Layer, Transport Layer and Network Layer. The EV and EVSE communicate with each other over Power Line Communication (PLC). During the communication, EV and EVSE exchange various messages over IPV6 UDP/TCP Protocols. These messages have been described in ISO 15118 Part 2. The Data Link Layer and Physical Layer functionality is described in ISO 15118-3. 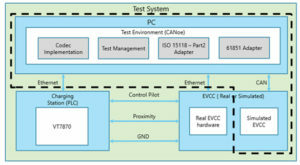 These test cases are only applicable for communication protocol defined in part 2 of the ISO15118 standard and do not consider any power flow between EV and EVSE. The conformance test cases in part 4 are specified for OSI network layer 3 and above. KPIT has developed a generic test framework for ISO15118-Part4 conformance testing and a simulated EVSE stack using CANoe and VT system from Vector. The reference architecture mentioned in section 3 was mapped as mentioned below. 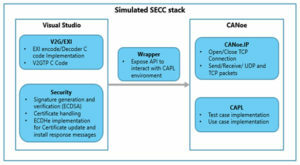 Codec: Efficient XML Interchange (EXI) Encoder/Decoder implementation. Codec: CANoe.IP was used for IPv6/UDP and TCP. ISO15118 Part2 Adapter: Supply Equipment Commnication Controller (SECC) timers and message handlers. ISO61851 Adapter: Application programming Interface (API) to control the SECC side control pilot circuit. Test Management: Implementation of CAPL unit test module for use cases and test cases. Creation of wrapper Dynamic Link Library (DLL) – Message API has been exposed as wrapper function to read and write data from CAPL. The below mentioned network architecture along with Graphical User Interface (GUI) was used for conformance testing. 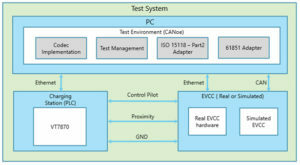 A complete test module to test whether the EV meets the ISO 15118 – 2 standard has been implemented. This consists of the all the 197 ISO 15118-4 Conformance Tests. Implementation of Concatenation hash based Key derivation function (KDF) algorithm. The Conformance test suite developed by KPIT using industry standard tools is easy to use and can be easily customized or extended to include additional test cases apart from the ones mentioned in the standard. It also ensures that the communication between EV and EVSE is according to the protocol mentioned in the standard and ensures that the EV is interoperable with independent implementations of EVSE.